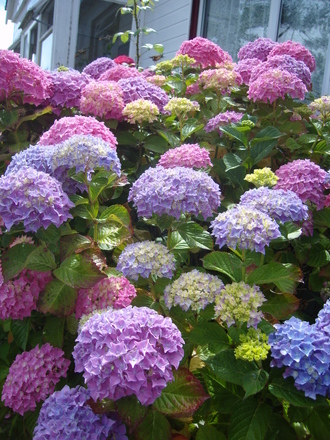 Mums Hydrangeas are lovely again this year… they are on either side of the front door of her bungalow…..
the ones on the left are all pink and the right hand side ones are all different colours…. what a fantastic show, absolutely beautiful, the colours are fabulous. They're gorgeous Holly and one of Carol's favourites! Lovely, does she feed them? I never have any luck with them so I'm jealous. Fantastic show. 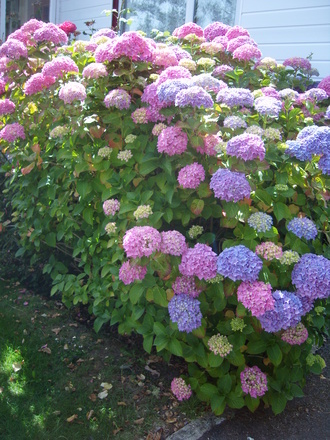 Hydrangeas must be one of the best shrubs and yet lots of people take it for granted. What an impressive entrance, nice colours too. I know someone who had a big blue one which was under the drain spout. 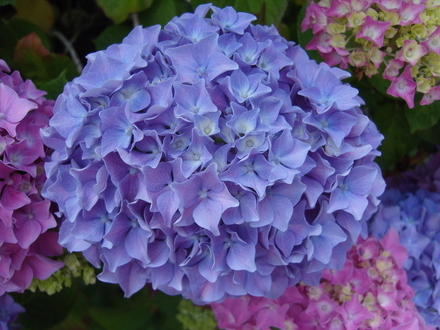 She had the old iron one replaced with plastic and the blue flowers turned pink. They are wonderful. 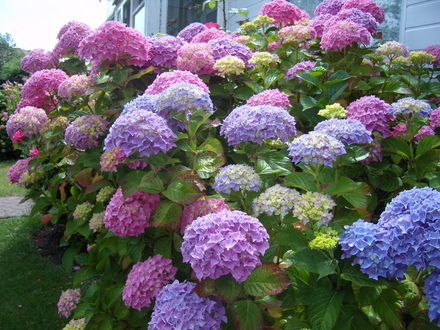 I love the different coloured ones. Your mother must enjoy them all summer. your mum's hydranga's are brill.mine are usually the same but i haven't had a flower on it this year.don't know what's happened. Mine are very late too potty so I would not worry. How beautiful, Holly! My new ones I planted last year are tiddlers in comparison, and only one has any buds. I'll just have to be patient, won't I! What a stunning display, Holly, very eye catching. Beautiful,mine are just starting to flower as well. 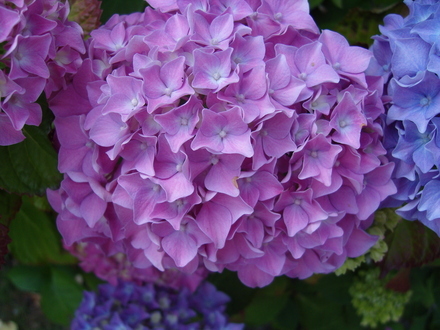 Beautiful pictures, I love these flowers I ordered a white one from jparker and it hasent grown in fact its dead!!!. I am pursuing a refund or a replacement. 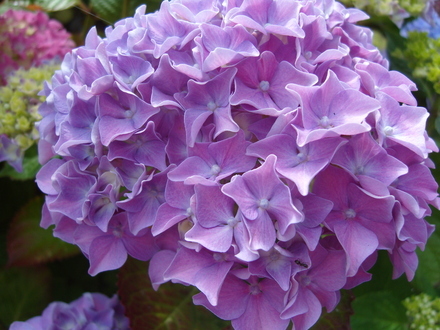 These plants remind me of my childhood as its the only flower I can remember having in my old garden. I think there lovely. Your mum has good taste Holly!! I love them too (childhood memories!) and I am going to find out if I could begin with just a small one in a large pot and see how it fares. I've heard too about putting rusty nails, cans etc. in the soil....does it work? 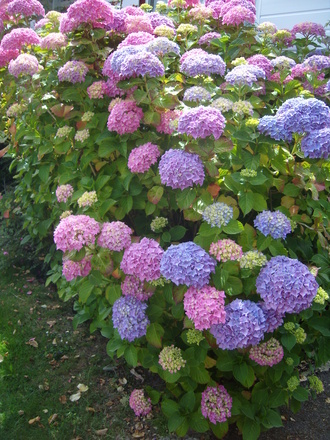 Although, I'm rather partial to the vibrant pink blooms...not so common as the blue/mixed. I bought a lacecap this time last year in Wyevale, they should have been 9.99 and was £1, I repotted it and its flowered lovely this year and I noticed that they have plants and seed quite cheap at the moment-- clearing out for 'you-know-what-' in december! Oooh....good plan Pam. I've got a Wyevale nearby....must take a gander. Ta for the thumbs up Holly & Pam. 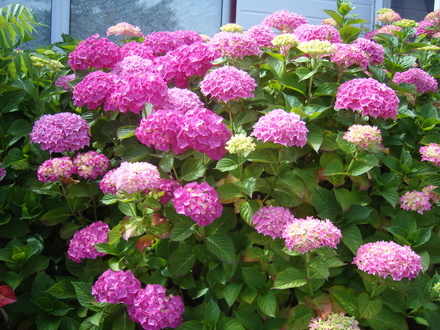 Of course if I'm successful at finding a bargain hydrangea (or maybe something else if it's going cheap...lol) I'll need a big plant pot for it as well! Maybe I could suggest this as my birthday pressie....only a couple of weeks away...hehe I feel a plot developing (garden and otherwise!). mind how you garden !! !